Hmm, can you post a screenshot of how it is defined in the Proclaim Webservice administrator? I've tried it with and without the End Point and still no joy. It's reading the WSDL file fine by the looks of it, however when I try and call the web service it just throws that error straight away. I'm new to this forum but I've got the exact same problem as this. or flatten wsdl file or create new output? Thank you Danny. Appreciate the tip. I've rewritten the wsdl file now by hand and then generated the code from it rather than the other way round. It looks like proclaim can now at least call the service from a linked action but isn't very interested in returning the value of the response to the mapped the output parameter (op-blah). I got a guide for doing this from eclipse but it isn't very detailed...could probably have done with a simple end-to-end worked example to base it on. If I ever get it working, I might write one myself. Any advice on above appreciated but thanks again. This example just takes two numbers and uses a webservice to add them together. * WSDL: \\server\prodisk\proclaim\wsdl\calculator.wsdl //or wherever yours is saved. in its simplest form, you can now exit WSA, and do all the field mapping in Proclaim Maths (e.g. Iinked Action). 4) Create a new Linked Action "ADDITION" or whatever. 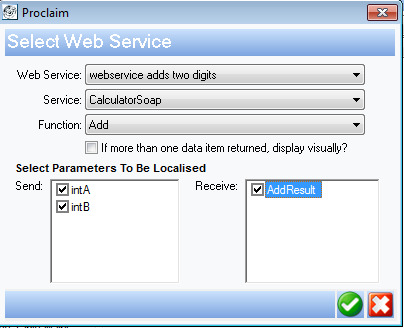 5) Click the "Call a Webservice" wizard. We pass input values via the the 'ip' input variables, and receive the result back through the 'op' variable. "Success! 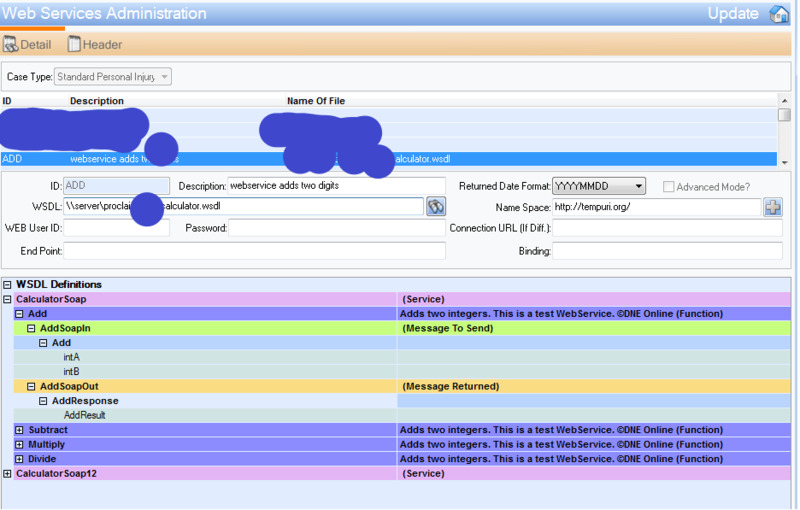 5 + 4 = 9"
* receive XML back from a webservice and import it with XML Data Template. Some gotchas for more advanced webservices. 2) SOAP1.2. Word on the grapevine is that these are better supported in later versions, but for ease stick to SOAP1 services. 3) WCF published webservices. The WSDL formats are not as well supported by the Proclaim Webservice parser, especially for complex datatypes (e.g. returning multiple values via a user-defined object via default Serialiser). If you are writing your own, consider sticking with asmx. 4) Overwriting or updating a pre-existing Web Service Administration entry can be a headache, e.g. if you are upgrading an existing service with more functions, this can sometime corrupt any field mapping you have defined in WSA. 5) If a webservice maths call crashes in Main Case Handling, sometimes each subsequent webservice call will continue to fail to run properly until you quit and restart proclaim, even if you think you've fixed the issue. Wow steve! Thank you for this. I will try first thing on Monday morning and will report back. Not gonna lie...I couldn't wait until Monday. This example worked great. Thank you so much for the effort to share this. I will go back through what I did and correct...I think the (latest) key mistake I've made was to answer "Yes" when it asks if I want to edit in advanced mode. Big thank you again for the example.